Several weeks back, I chanced upon a black Dodge Viper GTS coupe, considered to be the second generation of the machine (h/t to TractorPillow). That was a neat car, but for me, this is even cooler. 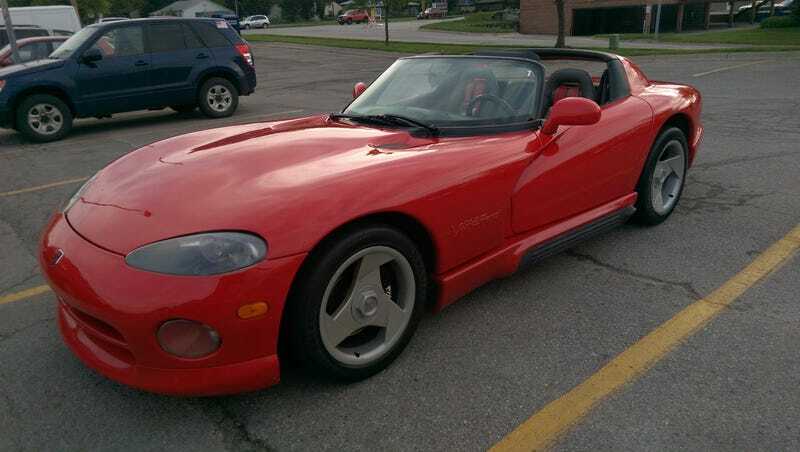 This is an original Viper RT/10 roadster, the first of the breed, produced from ‘92 to ‘95. This car is as raw and as savage a driving experience as you can find, so they say. Certainly, one look at the comically barren interior or under the hood at the massive 8.0 V10 leaves me with no trouble believing that this snake is a man-eater. The main safety features are the fire extinguisher and some beefy 3-point harnesses. Screw safety, this car is good for your spiritual health.